Full four hundred thousand years ago Britain was cast from the world, when the ice that linked it to Europe melted. The country and its people subsequently developed in a non-standard way, and thus Stanley Unwin, and spanking, and the deep-fried chocolate bar, which is a chocolate bar that has been deep-fried and coated in Marianne Faithfull batter. The advent of global mass media has done much to make the country and its people normal, but there were nonetheless a few years during which Britain's ancient weirdness and the computer revolution coexisted. I call these years "the early 1980s". From this nexus arose a pair of games that are very obscure on the international scene, but are fondly remembered by British men of a certain age. 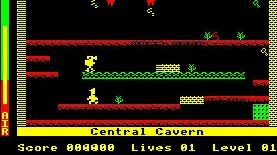 Manic Miner was the first; Jet Set Willy, its sequel, was the second. Manic Miner in particular was one of the early killer apps for the ZX Spectrum, a home computer which dominated the British computing scene during the 1980s. It was the brainchild of Clive Sinclair, a British electronics enthusiast who had tried throughout the 1960s and 1970s to make a business out of electronic gadgets, initially miniature radios, and then pocket calculators and digital watches. They were often very clever examples of cost-cutting miniaturisation, and sold at keen prices, but they soon developed a reputation for shoddy build quality and months-long delivery delays. His company wasted a lot of money on a miniature CRT television that nobody wanted, and a combination of economic recession, faulty products, and competition from the Far East eventually did him in. Sinclair had a knack of raising his business from the grave time and again. After the calculators and digital watches died a death he discovered the microcomputer, back when people still called them microcomputers. His machines used off-the-shelf components, and were originally sold in kit form; they were cheap, and that was important in the British market. Early efforts such as the ZX80 and ZX81 were barely more advanced than programmable calculators, although they sold well because there was a widespread perception that the computer revolution was the next big thing, and that Britain needed to transform or die, and furthermore the novelty of being able to type words onto the television was very powerful. The ZX Spectrum of 1982 was far more impressive than Sinclair's earlier machines. A colour display, 48kb of memory in the posh model, an optional printer and mass storage, rubber keys rather than a touch-sensitive matrix, £175. It outsold the more expensive Commodore C64 handily, and for a few years Clive Sinclair seemed like the future of British industry. Although the machine flopped in the important US market he was knighted in 1983 and became Sir Clive. Almost immediately he fell back into his bad old ways, producing a string of unsuccessful products that culminated in the Sinclair C5, a wobbly plastic electric scooter that became a national joke. Sinclair was forced to sell his business off in 1986, and nowadays he is a champion poker player and member of high-IQ society MENSA who is famous for having his way with numerous women who are younger than him. He also designs electric bicycles that nobody buys and wears a shirt and tie all the time, like a one-man Gilbert & George. That's enough about Clive Sinclair. In the next section, which is a few lines down the page, I will talk about Manic Miner. I would pay money to see Clive Sinclair do something on telly with Gilbert & George. They could call themselves Gilbert & George & Clive. I picture them in matching C5s, doing something both artistic and scientific. Yes, I'm cheating. It's bloody hard. It is impossible to separate Manic Miner from its author, eccentric loner genius Matthew Smith. British games writers of the period tended to fit into three basic groups. There were the former mainframe programmers and electrical engineers, such as Geoff Crammond and David Crane, who had decided to try their hand at games; these were serious men who produced serious games that involved physics. Then there was the next generation, the kids who grew up actually playing the games; like you or I they toyed with the idea of making their own games, but instead of giving up after writing a plot and designing a few sprites they did it. They were driven by a satanic lust for money, fame, and glory. Most of them ended up writing movie tie-ins for Ocean Software, or cheap BMX games for Codemasters. And there were the crazed eccentrics, with wild hair and strange obsessions. Jeff Minter is the most famous of these. He loved llamas and yaks and he dressed like a hippie because he was a hippie. A new breed of electronic cyber-hippie. Still is. "Too weird to live, too rare to die." Matthew Smith was the other one. He dressed in normal people clothes - although he did not wear socks, as at least two contemporary interviews in different magazines pointed out - but had huge black hair that hid his face. He was a one-man software development team at a time when such a thing was still viable, and his games reflected his personality alone, his love of Monty Python and underground comics. Nowadays such people are confined to the world of indie games, or open source operating systems; in 1983 it was just possible for this band of loners to become a major force in the mainstream games industry - to shape it around themselves. Albeit that the industry was much smaller than today, and I am only talking about Britain. Smith had an early start, having his first game published at the tender age of 16. It was a forgettable title called Styx, a little bit reminiscent of the 1980 arcade game Wizard of Wor. Although the gameplay was simplistic, it featured smooth sprite movement at a time when Spectrum games tended to flicker like mad. It had been submitted on spec to Liverpool-based Bug-Byte Software, and although it was only a modest success the company had enough faith in Smith to release his next title. He wrote Manic Miner over a period of eight weeks on a TRS-80, waking in the evening and coding straight until lunchtime the next day, at which point he crashed out until waking again. The game was directly inspired by the arcade hit Donkey Kong, and by Miner 2049er, an Atari 800 title that had been written by Californian Bill Hogue. Matthew Smith had been a fan of Hogue's earlier TRS-80 games, and had learned most of his programming nous by disassembling his code. On the suggestion of Bug-Byte, Smith set out to make a game with a miner and some caves, and jumping, and at some point his imagination took over and added lethal toilets and falling Skylab space stations and Pac-Men with legs. Miner 2049er itself was never released for the Spectrum, which led to an urban legend amongst Spectrum owners that Smith's game was a direct copy; in reality the two were very different. 2049er was far closer to the fast-paced action of Space Panic and Donkey Kong, whereas Manic Miner placed much more of an emphasis on timing puzzles. 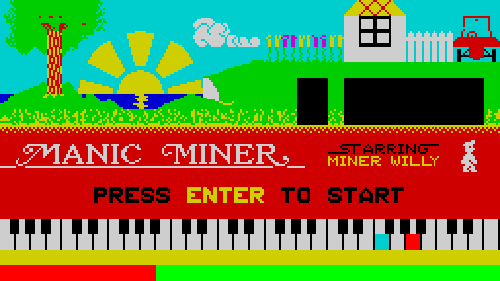 Ultimately ZX Spectrum players had to wait until A'n'F's Chuckie Egg before they got a decent Miner 2049er clone. Manic Miner was released in September 1983 for the 48K ZX Spectrum, at a regular full price of £5.95. It attracted glowing reviews and was a big success, remaining in the charts for months afterwards whilst contemporary hits such as Jet Pac and Football Manager and Ant Attack rose and fell. The game earned Bug-Byte a lot of money, although Smith's contract ensured that he saw only a small percentage of this. As a result of this dissatisfaction - interviews imply that the company had been using creative accounting to hide the game's profits - Smith left Bug-Byte to set up a new software house with some veterans of the local software scene. He had been under a freelance contract for Bug-Byte when he wrote Manic Miner, with a clause that allowed him to withdraw the game from circulation on written request, at which point the rights would revert to him. In retrospect this was a terrible mistake on Bug-Byte's part, and from early 1984 onwards the rights to Manic Miner were transferred to Software Projects, Smith's new home. The two editions had a few graphical differences, and were sold with different cover paintings. Bug-Byte went bust a year later. The basic gameplay is easy to describe. You play Miner Willy, who has stumbled on some underground caves, and your task is to collect a load of treasure and then escape. 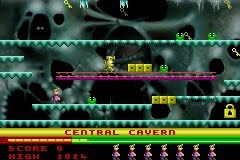 The cave complex is divided into twenty individual screens, each of which contains a number of treasures, and Willy can only progress to the next cave when he has collected all of them. Unfortunately the caves are guarded by monsters, and bushes, which are apparently poisonous. In fact anything that is not the ground or a piece of treasure is lethal. Furthermore Willy has a limited air supply in each cavern and cannot fall very far. The controls are very simple, just left and right and jump. This being 1983 Willy cannot be steered through the air, and thus the player has to make sure that he really wants to jump, because there is no going back once Willy is in the air. Too far gone. Ain't no way back. On a technical level it built on the smooth movement of Styx. The graphics were bold and colourful and generally avoided the ZX Spectrum's colour mixing limitations, and the game had the novelty of a continuous soundtrack - a blippy version of Greig's "Hall of the Mountain King" that looped and looped and looped, in addition to a deranged and off-kilter version of "The Blue Danube" on the title screen. The game also had a proper ending, another novelty. The original release on Bug-Byte was accompanied by a competition, which was something of a fad for the period. The idea was that the first bunch of people to decipher the secret message on the last level were invited to a play-off in order to win a grand prize. The October 1983 edition of Computer & Video Games reveals that a man called Jim Wills was the first to perform this incredible feat. He won a colour television. The playoff was apparently scheduled for Christmas of that year, but I can find no record of it ever taking place; Matthew Smith left Bug-Byte around that time, taking the game with him, so perhaps it was quietly abandoned. "What do points mean? Prizes!" If this was a magazine, and not a blog, this paragraph would be in a little box alongside the main text. It would be a boxout. Instead it is in a little box inside the main text, which means that it is a box-in. Ah-ha-ha-ha. Actual real physical prizes for winning a computer game were popular in the early 1980s. 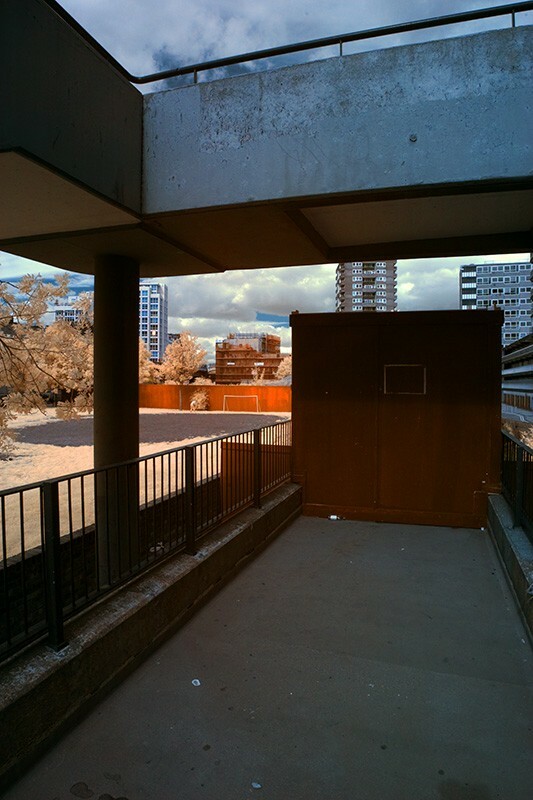 Domark's very first game, a multi-part (mostly) text adventure called Eureka! (1984), had a prize of twenty-five thousand pounds. Not a trinket or a trip to a theme park or anything clever, just twenty-five thousand pounds. Cold hard cash. Cheque, whatever. Other publishers were a bit more imaginative. The first person to beat Firebird's Gyron (1985) won a Porsche 924, one of the cheap mid-80s front-engined Porsches that you can't even give away on eBay nowadays. Automata's curious crossword-puzzle-of-a-game Pimania (1982) had a golden sundial worth £6,000. 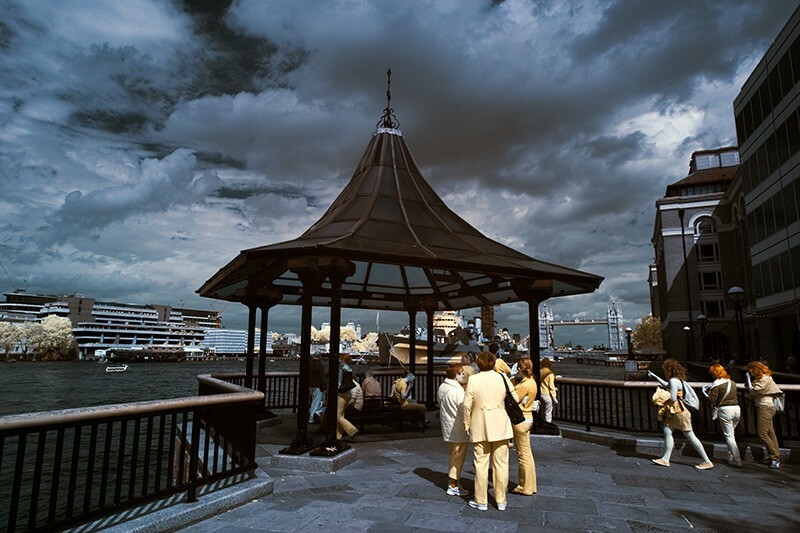 The clues were extraordinarily cryptic and the prize wasn't claimed until July 1985, by which time Automata had folded, although to the company's credit they handed over the sundial nonetheless. The epic Mike Singleton strategy wargame adventure thing Lords of Midnight (1984) had possibly the most bizarre prize of all; the idea was that the first person to win the game would have their campaign written up and published as a fantasy novel. Sadly this idea was scrapped although it seems ripe for rediscovery. At this point Google tells me that Retro Gamer wrote an article on the exact same topic ages ago, so I'll stop. I learn that the prize for winning Kokotoni Wilf (1985), which I always thought had a stupid name and I haven't changed my opinion since, was to meet Lee Majors. One man claims to have actually won this prize, although it doesn't seem like the kind of prize you'd boast about, especially if you are a man, which that man is. They don't mention Hareraiser, which sounds like a spoof of Hellraiser, although it came out in 1984, three years before the Clive Barker film. The prize was a golden pendant of a hare apparently worth £30,000, but therein lies a tale. The golden hare - the actual self-same golden hare - had previously been the prize for figuring out Kit Williams' illustrated book Masquerade in 1979. It had been buried somewhere in England, and readers were supposed to work out exactly where by solving a set of clues in the book. However the winner essentially stumbled on the prize by using a little bit of inside information and brute force. He then used the prize as collateral to fund a software house, Haresoft, for the express purpose of using the prize as a prize again. Having said that, there was an option of winning £30,000 in cash instead, in which case the hare might well have been sold off and then used as a prize yet again by somebody else. And it was all nonsense. Whereas Gyron and Eureka! etc were entertaining to play even if you didn't care about winning the competition - Gyron was dead spooky, in fact - Hareraiser was basically a big clue with no gameplay value, which sold for £8.95. And you had to buy a second game, Hareraiser: Finale, in order to enter the competition. You were essentially spending almost £18 to enter a competition. It was a swizz anyway, because the clues in the two games didn't mean anything. The whole thing was essentially a cheap rip-off of Masquerade that didn't work. Very few people bought the games and nobody won the prize, which was eventually auctioned off at Sotheby's in order to pay off Haresoft's debts. Still, it was a nice-looking hare. I mean, really nice. It's just the right side of gaudy and would not look out of place in a film. Kit Williams comes across as the kind of sincere, talented, hard-working creative type who was just born to be shafted. Over in the States, Atari's Swordquest series was probably the most visible game-and-prize offering; the company planned to release four element-themed games between 1982 and 1984, with the prizes being four expensive fantasy trinkets (a pendant, a chalice etc), with the grand prize of a great big silver sword with a gold handle worth $50,000, which was a fair sum in those days. A bloody great sword! A sword! The executives at Atari must have had an enormous cocaine habit. Sadly - thankfully for the winner's parents, sadly for the rest of us - the Great Video Game Crash of 1983 put the kibosh on the competition, and the last two games were never properly released. The final game was never even started, let alone finished, and rumour has it that the sword ended up in the possession of Atari's chief executive, who no doubt used it to dispose of unwanted staff when the Atari 5200 bombed. A sword. I was going to say "wouldn't it be funny if one of those deer hunter games had a Winchester rifle as a prize", in jest, but there probably was a deer hunter game that had a rifle as a prize. At this point the boxout is becoming as long as the article, but that's okay. I like it in here, it's cosy. Nice and warm. And that was the last I saw of Kim Cattrall. The boat pulled away, and then she was gone. Manic Miner is a notoriously difficult game. Although it belongs to the platform genre it bears few similarities to the evolved style of Mario and Sonic. Its gameplay is a lot less forgiving and a lot more rigid; it resembles an ultra-hard Mario ROM hack, a kind of prehistoric ancestor of Kaizo Mario World. There is usually only one way to complete each cavern, which must be carried out with a mixture of pixel-perfect jumping and split-second timing. Nowadays, with save states, this is frustrating but not impossible, but in 1983 there were no save states, and the player had to finish it in one sitting. 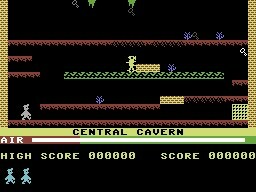 The first few caverns were fairly simple - although the very first room had a couple of tricky jumps - but beyond level five or so the difficulty ramped up into Ghosts & Goblins territory, at least until the player had memorised each level's pattern, which required a tonne of playing time. Penrose triangles, a shape adopted by Software Projects as their logo. Is time measured in tonnes? An aeon, then. In addition to the soundtrack and the proper end, Manic Miner also threw in a number of gameplay elements that were still quite unusual in those halcyon days. The first screen had conveyor belts and collapsing platforms; level 14, the Skylab Landing Bay, forced the player to dodge Skylab space stations that fell from the top of the screen; level 19 featured a set of moving mirrors that reflected beams of light which sapped the player's air. The game was pumped full of Smith's peculiar sense of humour. Level five featured a caricature of bespectacled former Bug-Byte executive Eugene Evans, whose lair was filled with lethal toilets that had been demanded by Smith's three-year-old brother. Levels eight and twelve featured an alien Kong Beast, a kind of green-skinned version of Donkey Kong who you could drop into a vat, although you didn't have to do this because Matthew Smith did not like violent computer games. Other levels featured hopping Pac-Men, and Ewoks from the hot new blockbuster film Return of the Jedi. The overall impression was of a game that had never in front of a committee, or indeed one that had not been near a lawyer (some later ports removed Kong). Manic Miner was ported for almost all of the contemporary 8-bit machines that were sold in the UK, including such oddballs as the Oric 1 and Dragon 32. The Commodore C64 port was generally faithful, presented in a "windowboxed" format, although the graphics had a strangely washed-out look. 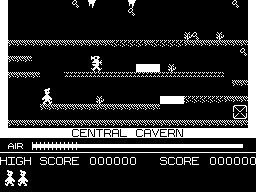 There was also a Commodore C16 port that retained all of the levels, albeit in simplified form, which was impressive given that the game had never been released for the 16K version of the ZX Spectrum. Manic Miner was even ported for the 16-bit Commodore Amiga, in 1990, although this version received mixed reviews. The graphics were enlarged and Miner Willy grew a huge nose, but for some reason the designers chose to make the levels larger than the screen, so that the display had to scroll to keep the player in sight. There was also a port for the abortive early-90s Sam Coupé, an 8-bit machine released in 1989, during the heyday of the 16-bit machines; this was more faithful than the Amiga version, but the Coupé was a lost cause and so very few people got to play it. Outside the world of mobile phones the most recent port was a 2002 version for the Game Boy Advance, which combined the scrolling of the Amiga version with the enhanced speed of the Coupé port. I'll be damned if I could find an Amiga disk image of the game, and although I finally got an Oric emulator to run - after spending ages trying to find the machine's ROM - I lost the will to live before managing to get a screenshot. The game's simplicity lent itself to unofficial conversions and fan-made sequels. Top ZX Spectrum fan site World of Spectrum lists dozens several. Amongst the most notable were ports for the Science of Cambridge Z88, an A4-sized laptop designed by Clive Sinclair, which had an 8x80 pixel LCD display. As with the Amiga version this had to scroll in order to fit the game onto the screen, and although it was probably not very entertaining I imagine that the feat was impressive enough. The game was also reworked for the Hewlett-Packard HP-48 graphing calculator, and the Sinclair ZX81, a machine with 1K of base memory (expandable to 16K). Green slaaaaaahm! A while back I had a look at the Vivitar 70-210mm f/3.5 Series 1, an old lens from the 1970s that was part of Vivitar's posh range. The company made a bunch of Series 1 lenses, which were accompanied by full-page adverts in the camera press which bigged them up as if they were the best thing since sliced cornflakes. 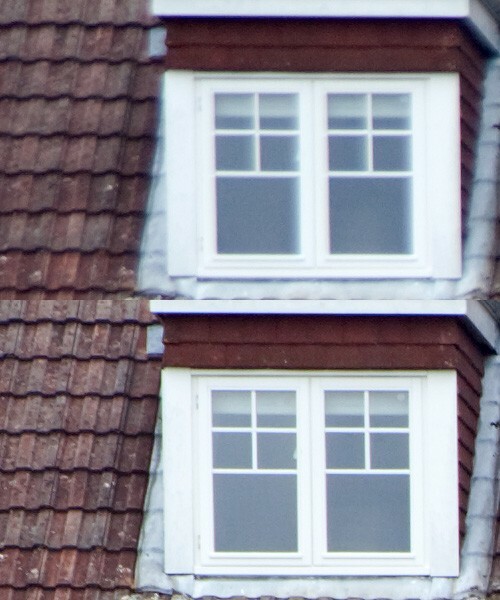 The 70-210mm isn't bad, and I was curious about the others. You'll notice they call it an Auto Variable Focusing Lens rather than a Zoom lens. There are two reasons for this. 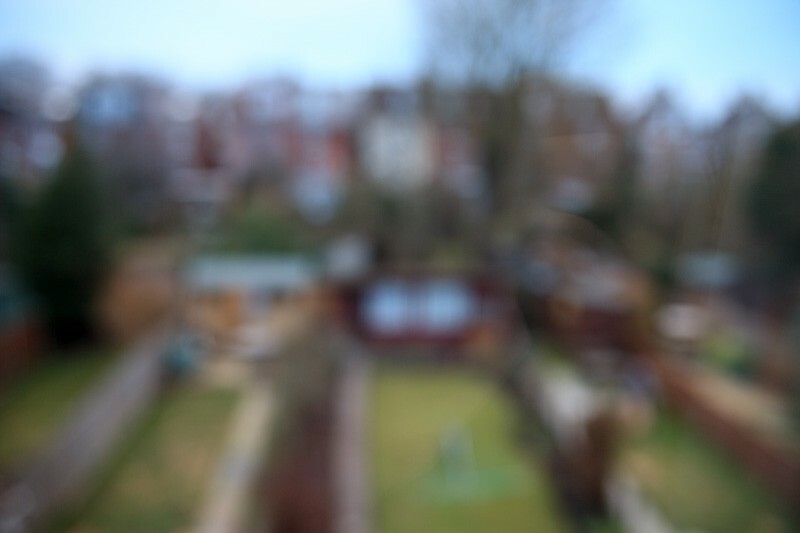 Firstly, the focal plane drifts when the lens is adjusted to a different focal length. Secondly, it sounds clever. 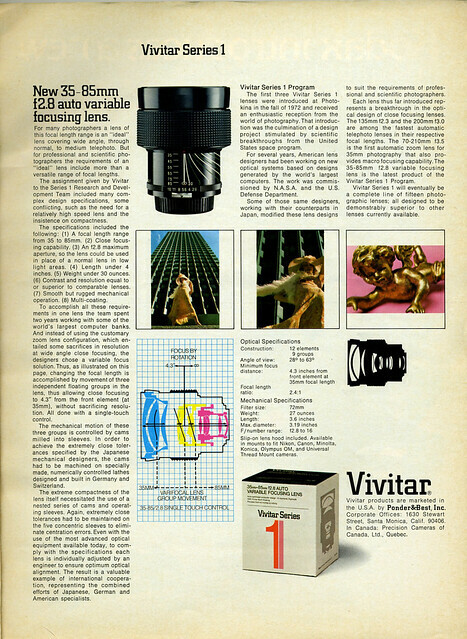 Vivitar was a marketing organisation - the company didn't build or design lenses, they imported and rebranded them, or in the case of the Series 1 range they came up with a specification and got other companies to do the business - and they knew how to come up with plausible-sounding scientific nonsense. Reading through the Popular Science article I am struck by how similar it is to the advertising text above, almost as if the author had just rewritten the press release and submitted it to the magazine. You can't imagine that kind of thing happening today, eh? It's a chunky, heavy metal lens. The 22XXXXXX serial number means that it was made by Kiron, and on a mechanical level it feels complicated. The lens extends towards the middle of the zoom range, and the front element rotates freely when zooming, but not when focusing. Scattered around it in the photograph are screws and parts of the aperture mechanism, and therein lies a tale. I spotted it on eBay, without any indication of the mount other than a K/AR engraving on the side on the lens. 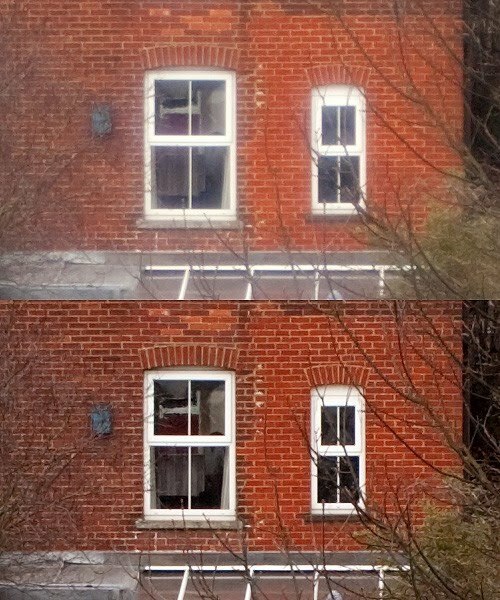 I have a Pentax K adapter, so no problem, although it didn't seem to fit properly. Reason being that the lens was actually built for the Konica AR mount, not Pentax K.
The AR mount is one of those dead old lens mounts that can't easily be adapted for Canon EOS. The bayonet fits easily into a Nikon or Olympus OM-EOS adapter, so it's not hard to physically mount the lens, but the flange distance is radically different. In order to have a Konica lens focus to infinity on an EOS body you have to remove almost half a centimetre from the optical path. Which I did. Vivitar made their lenses for a range of different lens mounts, and I assume they picked the longest flange distance commonly available and designed around that. The aperture ring for the Konica version of the 35-85mm seemed unusually long, so I unscrewed it, reversed the aperture fork, and JB Welded an OM-EOS adapter to the bottom of the lens. 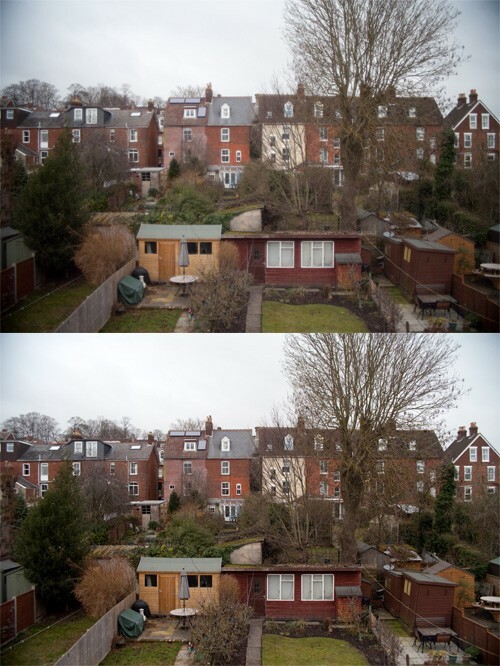 Now it focuses to infinity on my 5D, although I stress that you should take the following with a pinch of salt, because there's no guarantee that I mounted the OM adapter perfectly parallel to the film plane. I surmise that a conversion of this nature would be impossible with an actual Konica Hexanon lens, because there wouldn't be enough free space. The aperture is built very nicely, by the way, with a ring of ball bearings that still move smoothly after almost 35 years. A chap called Boggy hosts the service manual here, if you plan to strip the lens down all the way. Baby. 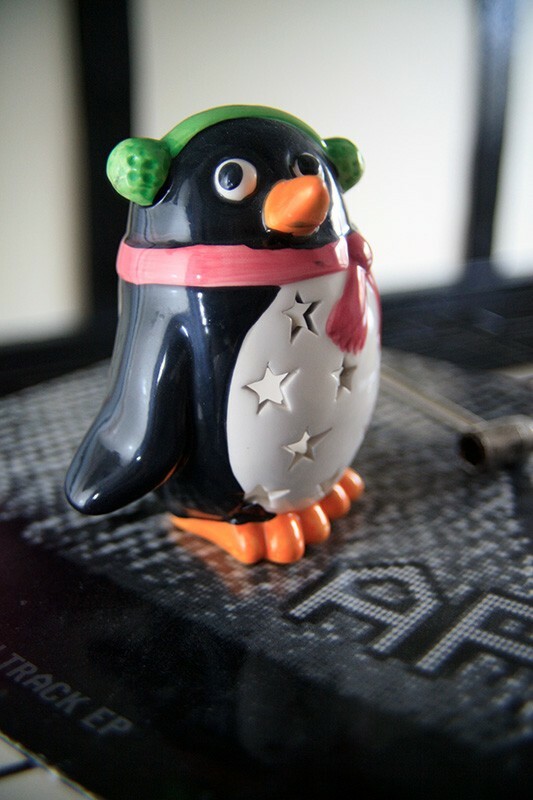 The Tamron's bokeh is much smoother. Also, next door's shed is clearly a huge face. Smoking a pipe. And it's staring at me. A huge face smoking a pipe and it's always there, even when I'm not looking at it. Still, there isn't much about the Vivitar 35-85mm on the internet - the typical mixture of people asking what it's like, and old men who used it in the 1970s and loved it because they were young, and people who uncritically accept sized-down shots of soft flowers and cats etc as proof of the pudding. 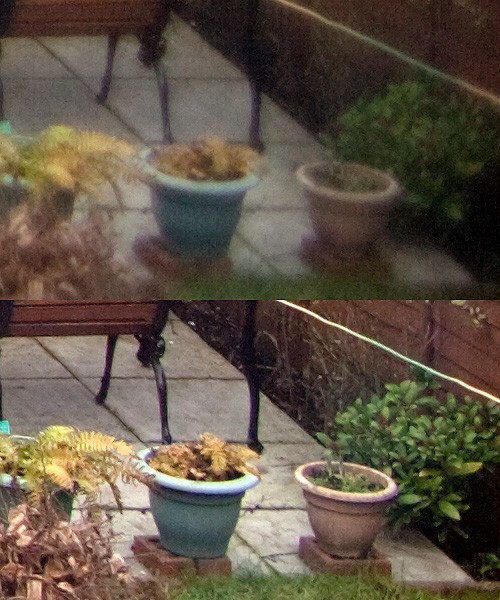 No-one wants to hear bad things about old lenses, because the lenses are underdogs. Most people feel pity for them and allow their judgement to be clouded by their emotions. I however am not like most people; I do not feel pity. Or compassion. Or mercy. The first chap on this page also does not feel pity, and it's interesting to compare his conclusions with mine (that the lens is horrible wide open at 35mm; better stopped down; generally better at 85mm). Ordinarily I would try and shoot something more interesting, but it's England, January, freezing, overcast, damp, and I have a cold. The 35-85mm f/2.8's specification is a classic one. The very first 35mm zoom lens, the Voigtländer-Zoomar of 1959, was a 36-82mm f/2.8, and Nikon sold a 35-70mm f/2.8 until as late as 2006, by which time the 35mm wide end was very old-fashioned. Most modern standard lenses start at 24mm or 28mm, and for this reason the Nikon 35-70mm f/2.8 has a bit of a cult, because it sells relatively cheaply on eBay despite being a one-time top professional lens. Vivitar's 35-85mm was introduced at a time when such lenses were accompanied by dedicated wide angle zooms that tended to go from 25mm, 28mm to 40mm, 50mm or so. Vivitar's wide angle zoom was a 24-48mm f/3.5 Series 1. But I digress. The impression I get from looking at samples on the internet and using some of these old lenses is that some telephoto zoom lenses from the 1970s were pretty good, and some from the 1980s were very good indeed, but general-purpose zoom lenses had a long way to go before they could match good primes. People tolerated them because they were handy, because there was nothing else. 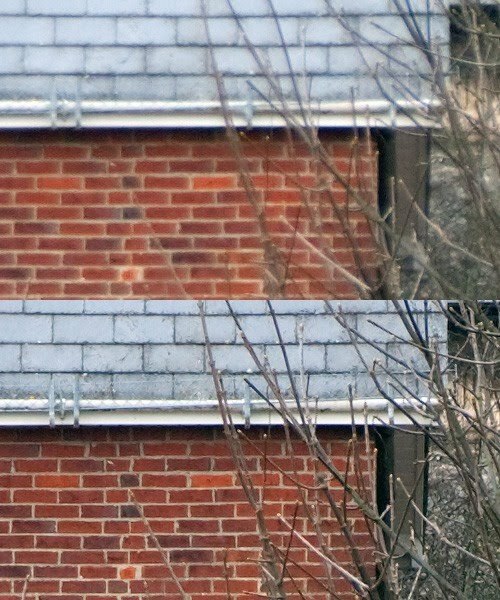 f/3.4 at the top, f/8 at the bottom, so it's not an exact comparison, with the same unsharp mask settings. Contax and Zeiss always emphasised contrast, it was their thing (and still is). The Contax lens has better multicoating, and it's sharper, and smaller, but the Vivitar lens isn't a dead loss. It's also much cheaper, and at the very least its 72mm front element looks impressive. It's consistent...ly rubbish at f/2.8, much better stopped down. It's a shame Vivitar didn't market it as a 35-85mm f/4, but then again I suspect that it would have been lost among a sea of other 35-85mm f/4 lenses. Ultimately, is it any good? Erm. On an APS-C camera it's sharp when stopped down, but I suspect your kit lens is sharper, and smaller, and it probably has image stabilisation, and a much more useful range. 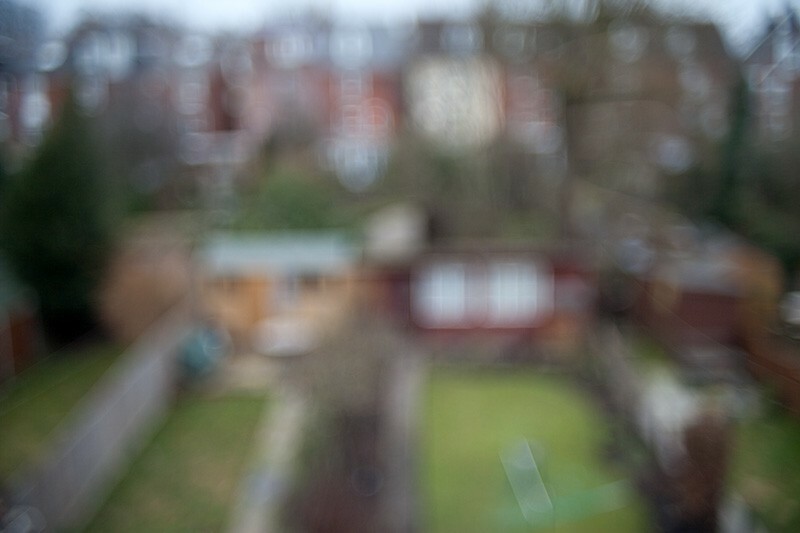 At f/2.8 it's characterful. On a full-frame camera it's the cheapest standard f/2.8 constant aperture lens around - the aforementioned Nikon 35-70mm f/2.8 (on the used market) and the (brand-new) Tamron 28-75mm f/2.8 are the next cheapest options - but the bokeh is gnarly, and it's larger and heavier than a pair of prime lenses. As a talking point or object d'art it's at least visually interesting. Be careful about dismounting it in public; it looks like an improvised hand grenade. Vivitar made it for Nikon F and AI, Olympus OM, "Universal Thread Mount" (actually M42), Pentax K, Canon FD, Minolta, and Konica AR mounts, of which the first four fetch the highest prices because they're easiest to use on modern digital SLRs. 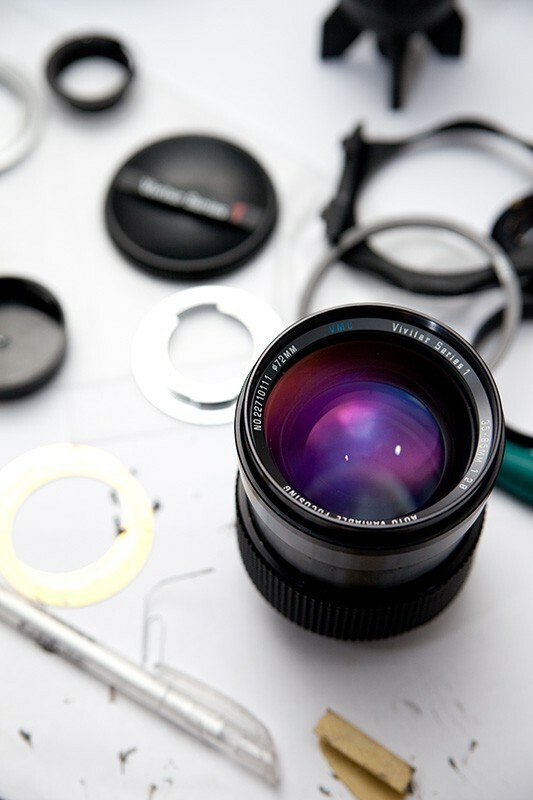 The Nikon and Pentax versions can still be used on modern Nikon and Pentax cameras; along with the OM and M42 versions they can be used on a Canon EOS camera with an adapter ring. Next, the Vivitar 200mm f/3.0 Series 1. Or a lengthy, detailed article about Matthew Smith's classic early-80s platform games Manic Miner and Jet Set Willy. Which will it be? EDIT: The answer was a lengthy, detailed article about Matthew Smith's classic early-80s platform games Manic Miner and Jet Set Etc. I eventually got round to the Vivitar 200mm f/3.0 Series 1 in April, viz. 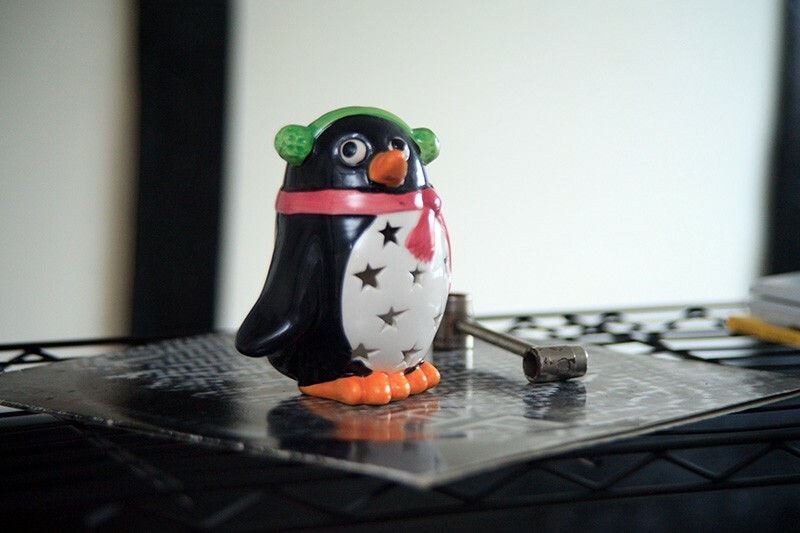 It's surprisingly similar to the 35-85mm - chunky, heavy, soft wide open (but not as soft), gnarly bokeh - but the focal length and aperture are much more useful. In the last post I talked about the hardware. Now you will see behind the curtain. But first a brief recap. Millions of years ago human beings could only see the colour green. This was not a problem, because everything that a human being needed to see - plants, the sea, animals, women - was also green. But there came a race of big cats who were yellow, and thus invisible to human beings. They fed well, until a few men and women evolved to see the colour yellow, at which point the tables were turned. Then a race of predators emerged who were pink; distant ancestors of the flamingo. Once again humanity ran in fear, until it evolved to see pink. Those people who could not see pink were eaten by flamingoes or starved for lack of protein; those who could, and who were physically fit and could throw rocks, survived and thrived and lived to spread their seed. And so eventually the human race evolved to see all the colours that nature could throw at us, and within a few millennia we ruled the earth, and the other creatures fled from us or evolved to become cute so that we would not eat them. I am still trying to factor the zebra and the penguin and the polar bear into my weltanschauung. See, they emerged at the poles, where human beings rarely tread, and so they don't have colours at all; and fish tend to be grey or pale blue, because they never see human beings, they only see nets and the bottoms of ships. NB Zebras obviously must have migrated from the poles. 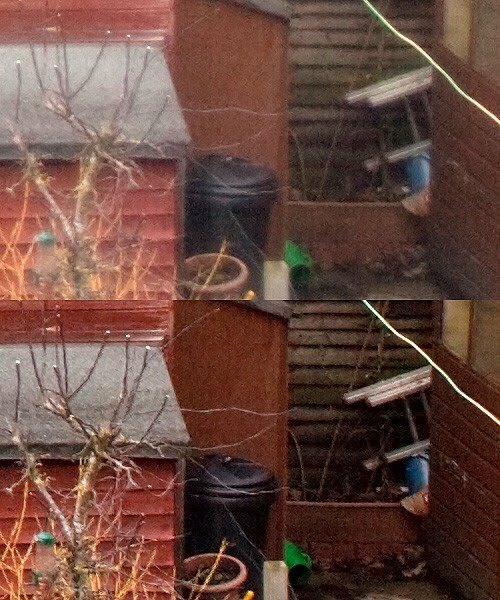 At the top-left is the original raw file, which looks very dull and red. 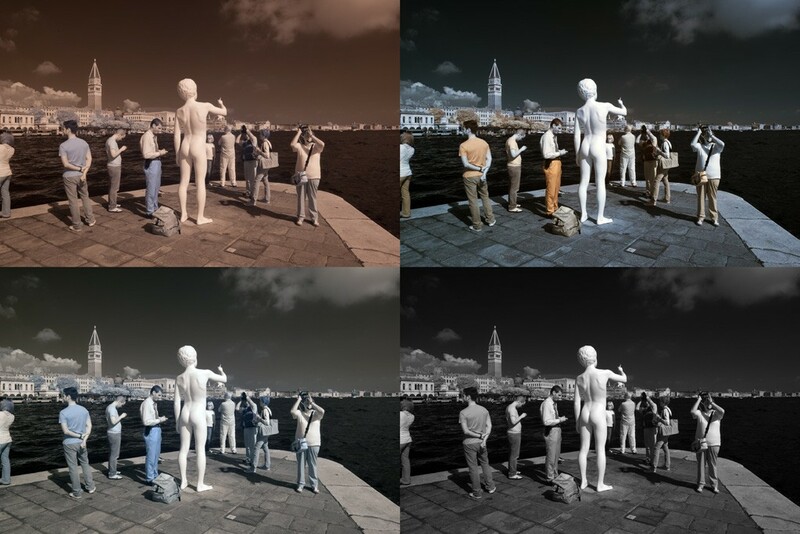 The presence of an infrared filter will befuddle the camera's white balance sensor, because it's expecting to see visible light; the redness of an infrared filter is beyond its ability to correct, although you can fix this during raw development. 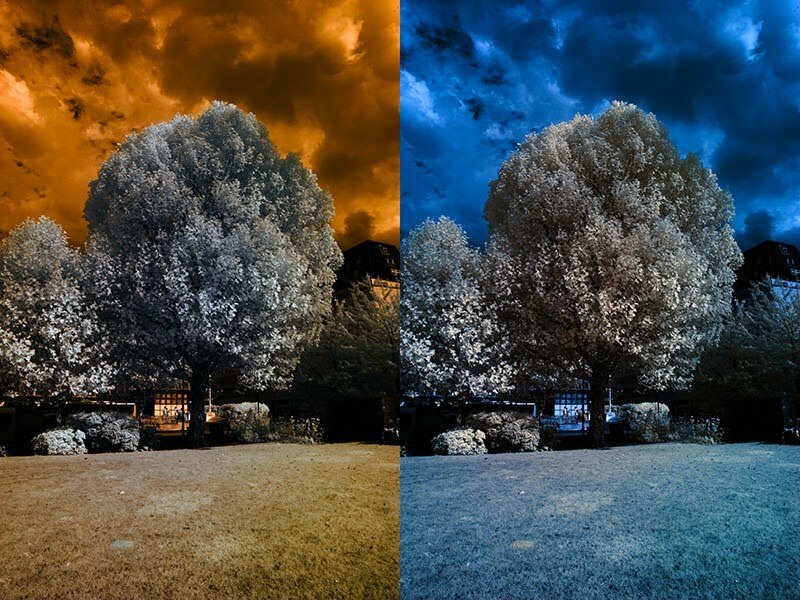 You can also speed the process along a bit by using a custom white balance taken from something that radiates a lot of IR, such as foliage. 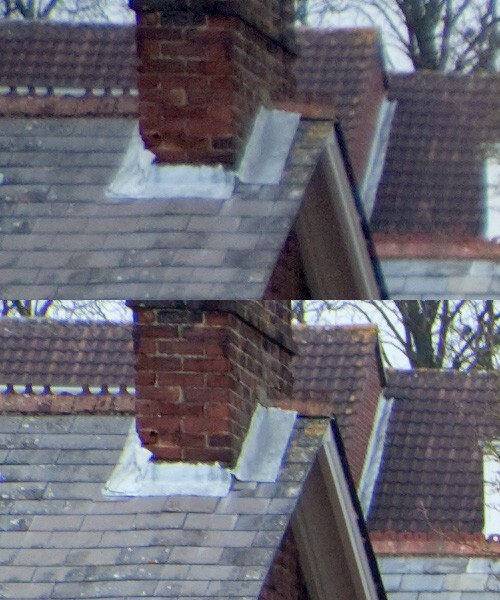 At the top-right is what happens if I apply an automatic white balance filter after developing the image with my chosen raw converter. I'm being purposefully vague here in order to be as platform-independent as possible. 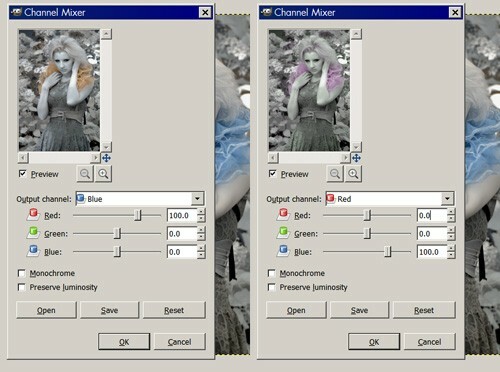 In Photoshop you might achieve this by using the image>auto color control, and if you are using The GIMP you might use colors>auto>white balance. 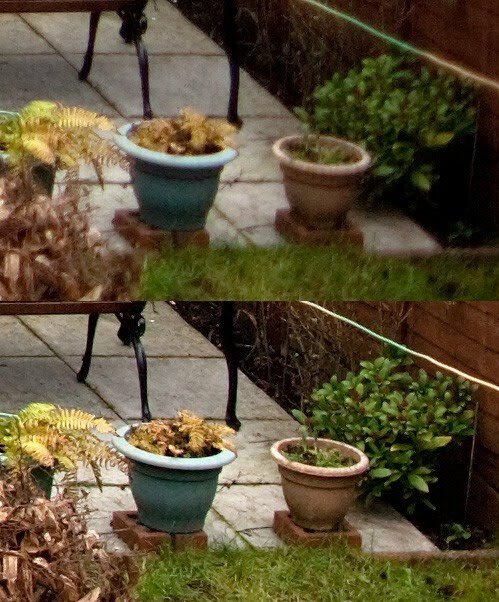 The GIMP's raw converter, UFRaw, and Canon's Digital Photo Professional do a good job of picking a suitable white balance automatically, although in practice DPP is generally very limited. Can you see what I've done? I've made the blue channel red and the red channel blue. There's nothing to stop you from fiddling with the green channel as well, or coming up with your own zany mixer settings. Nothing except for your own innate conservatism and lack of imagination, or perhaps you don't own a computer or a camera. At least I assume they are polyester. 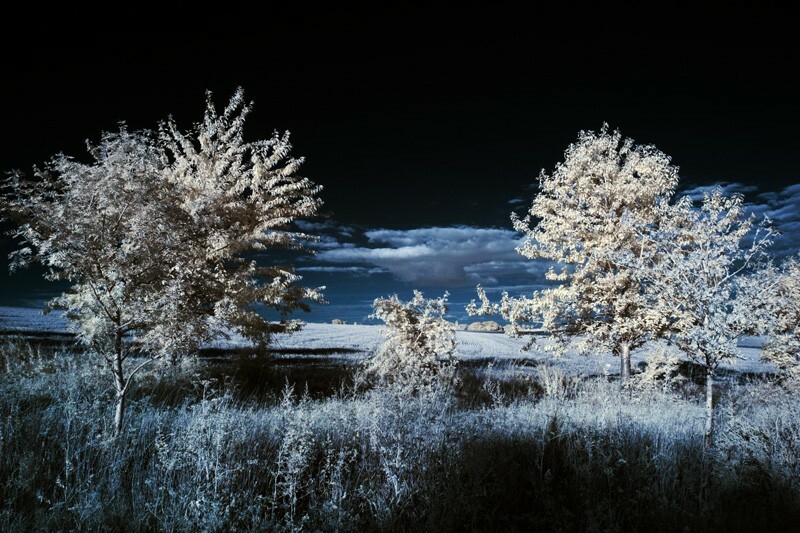 There is surprisingly little on the internet about the infrared reflectivity of trousers, although there is a little bit; it seems that British Army camouflage uniforms are treated with a special infrared-reflective coating, so that the soldiers blend in with the natural environment. Which makes a certain amount of sense, I suppose. The security guard in the photograph above stands out because he's standing in front of a lagoon and some buildings rather than a tree or a sand dune. 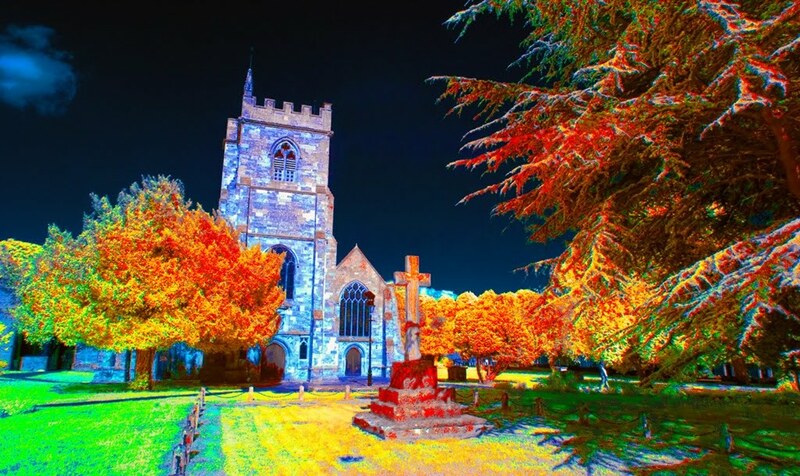 But surely the armed forces use thermal imagers, which see beyond near infrared? I have to assume that they know something I don't. Occasionally people ask me how to tell the difference between licence and license. I say think of James Bond; most of the time he is cold as ice but sometimes he becomes incensed, especially when the chief villain is silent about his mad science instead of ebullient. And that is how you tell the difference between licence and license. In the next post I shall explain the difference between innervate and enervate. 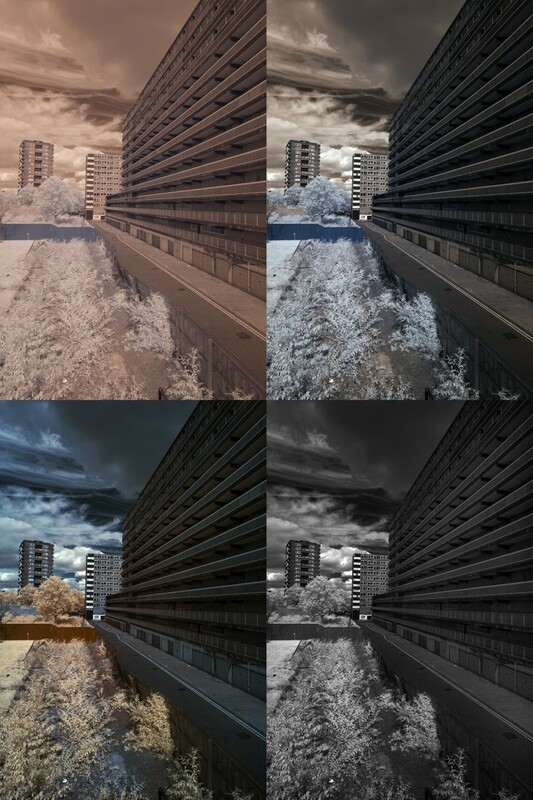 Oh, yes, you have to whack the contrast up. Whack it up; whack it up some more. Select part of the image and whack that up too. If you're working in black and white, really whack it up.